Within just 20 minutes drive from us you will arrive at the fabulous ‘Jardins d’Eau’, located between Gourdon and Sarlat on the D704. 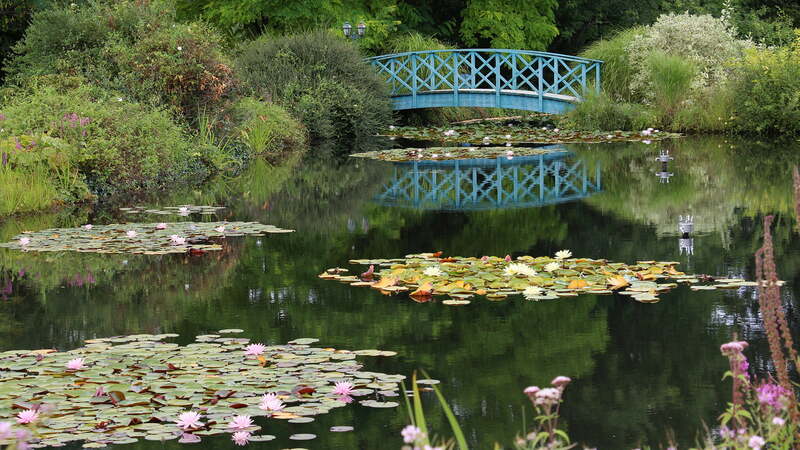 From our first visit many years ago when the project was in its early stages, we have seen these gardens grow into a beautiful array of vast flowering lily-covered ponds that greet you from the entrance with ornamental fish who swim in special ‘open-view’ tanks. You then walk across a suspended ‘aquatic labyrinth’, replete with many varieties of flowering plants and even a fine-spray shower to cool you on very hot days ! Further along you pass the cascading waterfall into the calm of the miniature lakes that reflect reminiscently of the water gardens of Monet’s Giverny, even with a pretty Japanese bridge, too. Finally, these vistas fall away through luminous Laburnum trees down to the Dordogne river at the base of the landscape. They are open during the Summer months up to the end of September from 10am until 7pm and for a little cooling shade from the sun, you can even hire a Japanese parasol for 50 cents! !